For me, “work” and “career” have taken on new meanings after becoming a husband and even more after becoming a father. As a result, vacationing with my family has became more important and gives me more joy than I thought existed in this life. There’s no imminent time clock in the back of my mind reminding me of upcoming work or tasks around the house. I can spend the time just “being”, and who better to be with than Lesley and Athena. I have a lot of fun being Athena’s dad. At my daughter’s request, I frequently imitate Donald Duck, Goofy, Mickey Mouse, Olaf (Frozen), Burt (Sesame Street), Bugs Bunny, Woody Woodpecker, and a few other random characters. Some I get right while others are way off but she doesn’t care; she’s just happy I’m making the effort and playing along in her story. But there’s a price for imitating these characters. She has to pay the toll and payment comes in many currencies: air launches, air drops, tickling sessions, long hugs, and being inverted in most of these situations. The moments I cherish with all my heart are those fleeting moments when I think no one is looking; it’s just Athena and I engaged in a silly activity or a funny conversation where the world around us melts away into the distant background. It’s in these moments when our bond strengthens tenfold per nanosecond. It’s within these slices of time when my sense of purpose is renewed, my willingness to move mountains for a smile from my daughter is instantly recharged, and my deep love for such a little creature is forged in eternity. 5. We all live in a [blue] submarine. Having a toddler has allowed me to unleash my inner child sans-apology. I get to gaze in wonder next to Athena as we both discover new cool things together. 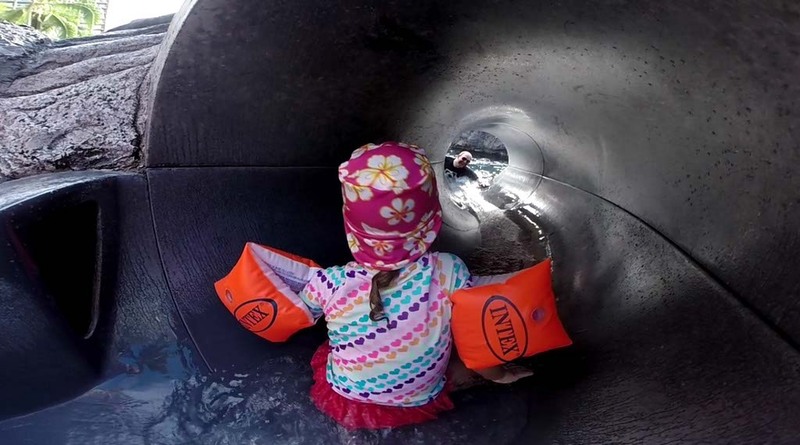 As we three were diving deep in the Atlantis Submarine adventure, Athena and I were both stuck to the thick glass port holes gazing at all the sea creatures, reefs, and shipwrecks which drifted by. Athena was in awe as these images glided past her. She didn’t understand how we were currently witnessing this unimaginable underwater world yet moments earlier were in a boat and walking down a ladder. I’ve always cherished witnessing “firsts” with Athena and seeing her unravel a mystery she is beholding. This was no exception; however, because I’m so in love with scuba diving and the underwater world in general, I was like Dug from the Disney film, Up! chanting “Squirrel!” at every new sight through that port hole. There are some sayings that only the parents of a child know the true, full meaning of and its raw essence. One of those sayings for Athena is, “Do it again?”. I put a question mark at the end because that’s really how it comes out of her; a question – but a very excited and hopeful one at that. The tone she uses while saying it really tells the true story. When the tone is backed by pure adrenaline, it’s typically when she’s just overcome a fear for the first time. As soon as I hear it, I know we will be repeating said activity for the foreseeable future and I have no problem with this whatsoever. One of these happened at the Paradise Pool where she went down a water slide by herself. When I caught her at the end and she realized she didn’t submerge and was completely fine, there came the “Do it again! ?” and off she went. Beautiful. 3. Motorboat, motorboat, step on the gas! This was an especially fun little moment at the Paradise Pool where Lesley grabbed Athena, balanced on my knee while I held onto both of them and she then said “Ok Dad, let’s spin!”. I started to spin in a circle as we 3 chanted the song. By the end we were spinning pretty fast when I started introducing “turbulence” and Athena was trying to hold on yet was grinning ear to ear. I loved that moment because we all got to watch each other’s expressions as we went faster and faster. One of the [many] things I love about Athena is her genuine curiosity. That sense of curiosity was in full flight during the Waikiki Starlight Hawaiian Luau by Hilton. As the different acts came onto the stage and performed their amazing dances and rituals, Athena was starstruck. She danced with them, she sang with them, she kept the beat, and she cheered them on. When the women made their high pitch sounds, she thought they were kittens; when the men came on with their fire torches, she didn’t blink yet she randomly yelled, “Aloha!” when they finished. She asked me questions and we made comments on each act as they progressed. I loved every moment of it. 1. Houston, we have lift-off. Yes, it’s true; I admit it. Sometimes I launch Athena up so high that it’s a little out of her comfort zone. And when I say little, I mean her reaction is “Daddy, don’t do that.”. Enough said. 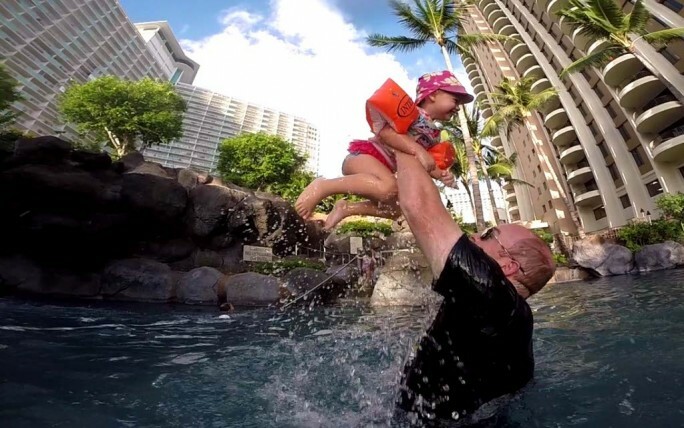 When we were in the Paradise Pool at Hilton Hawaiian Village, we had a great launch session where I was just enjoying the utter excitement on her face while I was tossing her up in the air. I could stare at that face forever.